* চিনিয়'ৰ ক্লাব অংশগ্ৰহণ আৰু গ'লৰ সংখ্যা কেৱল ঘৰুৱা লীগৰ বাবেহে আৰু এই তাৰিখলৈকে শুদ্ধ 01:38, 17 May 2014 (UTC). ↑ 1.0 1.1 1.2 1.3 "10 Messi". fcbarcelona.com. FC Barcelona. http://www.fcbarcelona.com/football/first-team/staff/players/messi। আহৰণ কৰা হৈছে: 6 January 2012. ↑ "Del Potro: Messi's the best player in the world". Marca.com. http://www.marca.com/2013/05/28/en/football/barcelona/1369765243.html। আহৰণ কৰা হৈছে: 15 September 2013. ↑ "Simunic: Messi’s the best of all time". FIFA. http://www.fifa.com/worldcup/preliminaries/news/newsid=1967479/?intcmp=fifacom_hp_module_interview। আহৰণ কৰা হৈছে: 12 December 2012. ↑ Smith, Ben. "Lionel Messi: Goals record caps golden year for Barcelona star". BBC Sport. http://www.bbc.co.uk/sport/0/football/20592977। আহৰণ কৰা হৈছে: 12 December 2012. ↑ "Lionel Messi hailed as 'incredible' and 'gigantic' by Gerd Muller after Barcelona star breaks record for most goals". প্ৰকাশক London: Telegraph Sport. 10 December 2012. http://www.telegraph.co.uk/sport/football/players/lionel-messi/9734839/Lionel-Messi-hailed-as-incredible-and-gigantic-by-Gerd-Muller-after-Barcelona-star-breaks-record-for-most-goals.html। আহৰণ কৰা হৈছে: 12 December 2012. ↑ "Arsène Wenger hails Barcelona's Lionel Messi after four-goal display". The Guardian (London). 7 April 2010. http://www.guardian.co.uk/football/2010/apr/07/barcelona-arsenal-lionel-messi। আহৰণ কৰা হৈছে: 12 December 2012. ↑ "David Beckham: Lionel Messi is the best". ESPN. http://espnfc.com/news/story/_/id/1410228/david-beckham:-cristiano-ronaldo-is-not-at-lionel-messi's-level। আহৰণ কৰা হৈছে: 12 April 2013. ↑ "Maradona proclaims Messi as his successor". China Daily. Reuters. 25 February 2006. http://www.chinadaily.com.cn/english/doc/2006-02/25/content_523966.htm। আহৰণ কৰা হৈছে: 8 October 2006. ↑ "Messi: Lionel Andrés Messi Cuccittini: 2003–04". BDFutbol. http://www.bdfutbol.com/en/p/j1753.html?temp=2003-04। আহৰণ কৰা হৈছে: 28 December 2013. ↑ 11.0 11.1 "Messi: Lionel Andrés Messi Cuccittini: 2004–05". BDFutbol. http://www.bdfutbol.com/en/p/j1753.html?temp=2004-05। আহৰণ কৰা হৈছে: 28 December 2013. ↑ "Messi: Lionel Andrés Messi Cuccittini: 2005–06". BDFutbol. http://www.bdfutbol.com/en/p/j1753.html?temp=2005-06। আহৰণ কৰা হৈছে: 28 December 2013. ↑ "Messi: Lionel Andrés Messi Cuccittini: 2006–07". BDFutbol. http://www.bdfutbol.com/en/p/j1753.html?temp=2006-07। আহৰণ কৰা হৈছে: 28 December 2013. ↑ "Messi: Lionel Andrés Messi Cuccittini: 2007–08". BDFutbol. http://www.bdfutbol.com/en/p/j1753.html?temp=2007-08। আহৰণ কৰা হৈছে: 28 December 2013. ↑ "Messi: Lionel Andrés Messi Cuccittini: 2008–09". BDFutbol. http://www.bdfutbol.com/en/p/j1753.html?temp=2008-09। আহৰণ কৰা হৈছে: 28 December 2013. ↑ "Messi: Lionel Andrés Messi Cuccittini: 2009–10". BDFutbol. http://www.bdfutbol.com/en/p/j1753.html?temp=2009-10। আহৰণ কৰা হৈছে: 28 December 2013. ↑ "Messi: Lionel Andrés Messi Cuccittini: 2010–11". BDFutbol. http://www.bdfutbol.com/en/p/j1753.html?temp=2010-11। আহৰণ কৰা হৈছে: 28 December 2013. 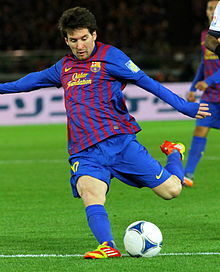 ↑ "Messi: Lionel Andrés Messi Cuccittini: 2011–12". BDFutbol. http://www.bdfutbol.com/en/p/j1753.html?temp=2011-12। আহৰণ কৰা হৈছে: 28 December 2013. ↑ "Messi: Lionel Andrés Messi Cuccittini: 2012–13". BDFutbol. http://www.bdfutbol.com/en/p/j1753.html?temp=2012-13। আহৰণ কৰা হৈছে: 28 December 2013. ↑ "L. Messi". Soccerway. http://uk.soccerway.com/players/lionel-andres-messi/119/। আহৰণ কৰা হৈছে: 28 December 2013.